With no experience in the division and having been away from the promotion for over three years, “Rush” is returning to the UFC for a title shot against Michael “The Count” Bisping. Now, fighters are beginning to voice their opinions. St-Pierre’s sudden rise to the top of the middleweight division has stirred up a few of the top middleweight contenders. Among them, former champion Luke Rockhold thinks “Rush” doesn’t want to fight. 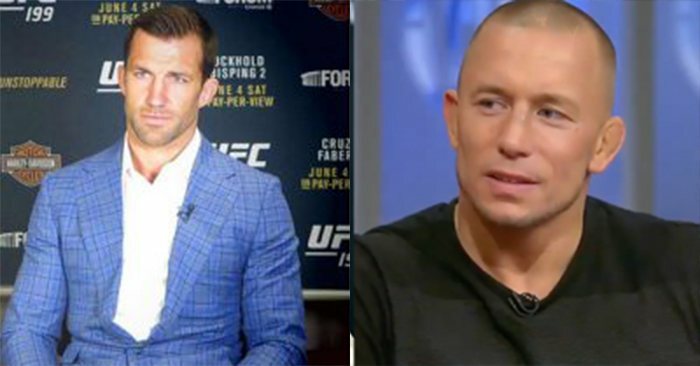 In a recent interview with TSN, Rockhold explained that he thinks St-Pierre has no interest in defending his title, if he defeats Michael Bisping. “George isn’t going to fight any of us there. He’s going to go back down, if he does happen to win.” Rockhold said. Ronda Rousey Training And Drilling For Pro-Wrestling — Watch!